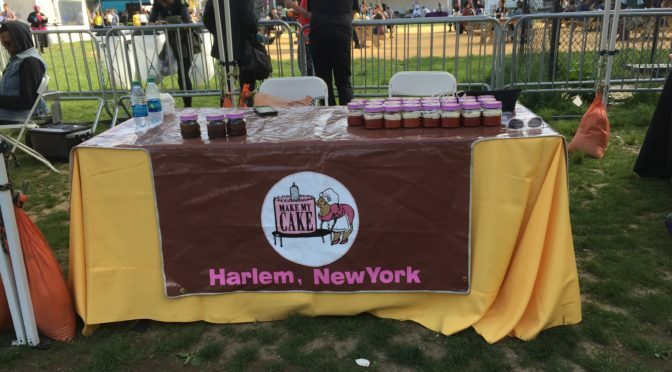 I attended the Harlem Eat Up event today on Sunday the last day of the event. It turned out to be a beautiful sunny day and I had a great time with my daughter. We attended last year and I must say this year it was bigger and better. It was well attended and they had a lot more booths and tables and chairs for people to sit. The music was playing the crowd was eating, dancing and having fun. We were at the area that was open to the general public. My daughter had her face painted and we had some sorbet that was being given out at the Aetna booth and we made a t-shirt there. We took our pic at the Citi booth and picked up a mason jar of Make My Cake red velvet. It was delicious! The wine and food event looked great but was not for us as I was there with my 2 and 1/2 year old but either way we had fun and so were many others at Harlem Eat Up 2016. The money raised went to City On Wheels and Harlem Parks and bought a lot of new and old faces to Harlem. Thank you for organizing a great event!